We rented a car in Barcelona and drove our way out of the big city for about 90 minutes until we reached the Priorat region. 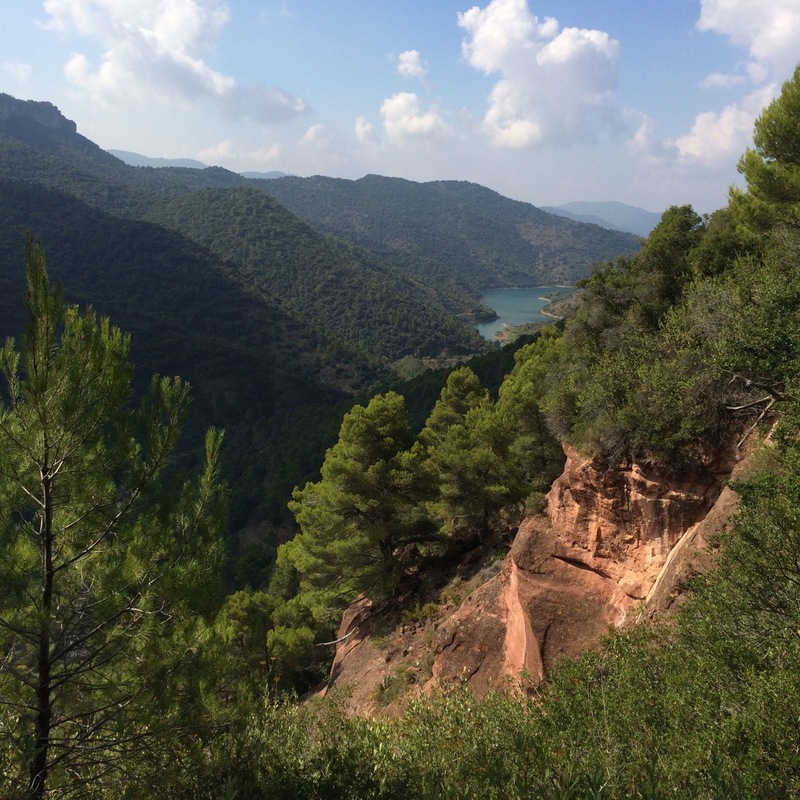 We like exploring different wine regions of Europe, having visited Italy and France, but when we discovered that Priorat also offered some great hiking, our plan to go there was settled. We left Barcelona mid-morning with a plan to stop for lunch somewhere in Tarragona, a coastal town that is located about 50 km east of Priorat. We were very fortunate to happen on Raco Del Abat, a restaurant located within the confines of the walled city center of Tarragona. It is operated by an efficient husband and wife team: he runs the front-of-house while she is the chef who does all the cooking. We didn’t make a booking ahead of time (shame on us! ), but they had one table left to seat us for lunch. Lucky us, since they offer an excellent set lunch menu for 15 Euros (~$18 US at time of publication) per person which includes a three course meal complete with wine and bottled water. This was our first discovery that great value-based meals (which tend to run mostly on weekdays) are readily available in Catalunya outside of Barcelona. The translation of the Catalan word “raco” means corner, and the restaurant is set on the corner of Carrer d’la Abat in Tarragona. The charming restaurant is painted a warm red with a Moorish arch separating the rooms (upper left photo). The friendly proprietor gave us the option (at a reasonable extra cost) of starting with a glass of vermouth as an aperitiu (aperitif), to which we enthusiastically nodded approval. The vermouth came accompanied by chips and olives (upper middle). It didn’t take us long to move on to a carafe of house red wine and sparkling mineral water (upper right) that came with the meal. The first course was a tasty mixed green salad topped with a breaded goat cheese patty (bottom left). The menu changes on a daily basis, and the proprietor asked us which entrée we would like to have: fish or meat. We went with one of each of course (bottom middle), and both items were truly delicious. We were also offered a choice of typical Catalan desserts and he brought us one of each: a pastry cake and a creamy fresh cheese served with local honey and hazelnuts (bottom right), the latter of which we have grown very fond of (click on photo to view larger). We found that a car is necessary for getting around Priorat, as it is a network of small hillside towns in a loop that can be traversed in a couple of hours. The loop itself is not that long at less than 100 km (~60 miles) total, but there are plenty of winding switchback roads that do take some time (and stomach stamina) to drive. 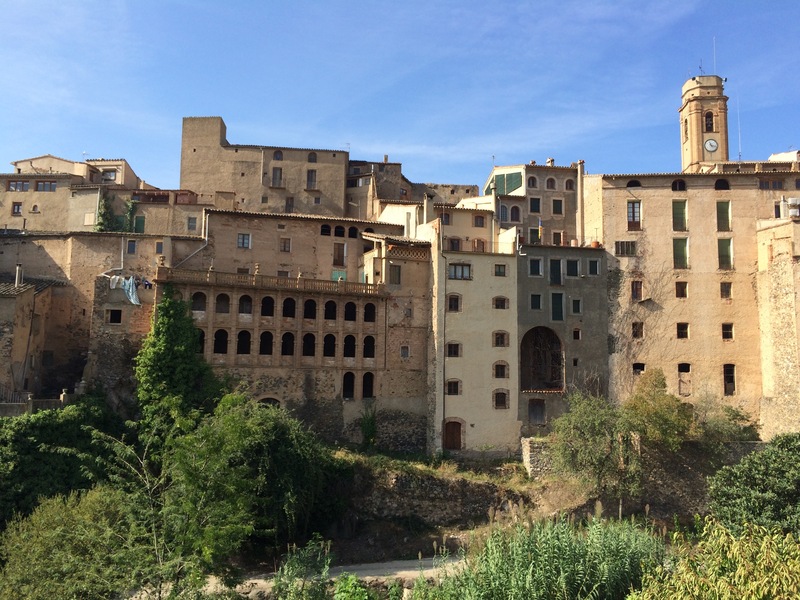 Most of the towns are small, with populations in the hundreds to a few thousand, so visitors may opt to stay at the larger cities outside of the region such as Tarragona or Reus, but we wanted to immerse ourselves and decided to stay in Priorat itself. We decided to stay at Hotel Rural Cal Torner located in Els Guiamets which served as our base. We can’t recommend it enough, as Barcelona native husband and wife team Antonia and Jordi run a charming hotel with plenty of local knowledge, helping us get the most out of our visit. Since Catalan has a very tight blood alcohol limit of 0.05 (lower than California! ), we decided to take half board and opted for the 16 Euro per person (wine not included) dinner at the hotel. They have plenty of wines available to purchase on site, so it turned out to be a great decision. Antonia does all of the cooking, and surprisingly, she told us that she really doesn’t like to cook but knows that they have to offer it as a full service hotel. Her disdain does not show in the food — both of the dinners were great. The table is set with olives that can be consumed at any time during the meal (upper left). Jordi made us some Gin Tonicas to accompany the olives. The dinner always starts with a salad, and Antonia asked us each morning what topping we wanted on the salad — the choices included anchovies, shrimp and salted cod (upper right). The vegetables are very fresh, and the balsamic glaze added a touch of sweetness to the slightly bitter greens. The entrées change on a nightly basis: one evening it was pork and another evening it was braised beef (bottom left). Desserts include a platter of dried fruit and nuts to which we added to our fresh cheese and honey (bottom right). Jordi provided us with locally made dessert wines from which we could free pour, and we definitely took advantage of that. Before we embarked on our hike through an ancient bridge in La Vilella Baixa, we stopped to have lunch in the only place we heard any noise coming from, the El Raco Del Priorat restaurant. Another place for a bargain meal where their set menu is very reasonably priced at 10 Euros (~$12 US) per person. We had to get by with our minimal Spanish to go through the meal, but the other discovery we made is that many of the Catalan set menus offer a juice to start. We opted to go with tomato juice, and our server brought out some house red wine in a Porron along with bottled water (upper left). There were several first course choices and we opted for the delicious baked Spaghetti (upper right) and a very tasty bacalao (salted cod), orange and olive salad (bottom left). For our main course, we went with medallions of beef and the Butifarra sausage, a local Catalan specialty made with pork and spices (bottom right). We were so full after this lunch that we opted to skip on dessert, and our server provided us with complimentary espressos in its place. Other than hiking, there are plenty of things to do in Priorat such as biking or doing some olive oil or wine tasting. We initially chose to go to Priorat since Garnacha/Grenache, one of our favorite wine varietals, is the primary grape grown in the region (along with Cariñena). Knowing that our luggage space was limited, we skipped the oil tasting but gladly went to a winery tour, arranged by Antonia, at Celler Burgos-Porta,, the DOQ Priorat producer of Mas Sinen. Run by husband and wife team of Burgos and Porta (picture right below), he was busy with harvesting while she graciously gave us (along with some others), a two hour plus tour and tasting. Porta explained that what makes the grapes special in Priorat is the “licorella” — the Catalan word for the black and reddish volcanic slate which forces the vines to root deep down for water and minerals. The tour, all conducted in Spanish, was very comprehensive, including tastes of their refreshing spring water, the different grape varieties pulled directly from the vine and the wines themselves. After the extensive walking tour, Burgos and his crew took us through the first crush process after they had finished harvesting. Needless to say, we made room for a few bottles of their wine to take home. On another day we were able to check out the historical ruins of the Carthusian Monastery, Cartoixa d’Escaladei. At the time we visited, apart from the ticket vendor and a security guard, we were the only people on the entire site, providing a more reverent experience. 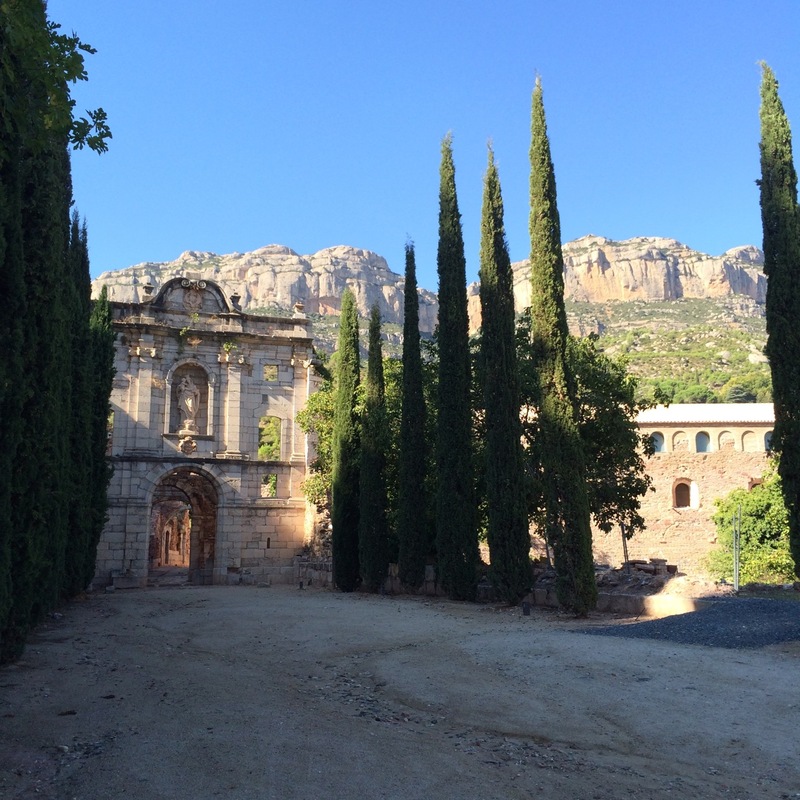 Originally developed in 1194, the Provençal monks who settled here brought their wine making knowledge to the area. The region is named after the monastic superior of the order, the Prior; hence a visit to the relic is an important part of understanding Priorat’s history. Beautifully set against the foothills of Montsant, there were several renovations over the centuries, and it operated as a full monastery until 1835 when it quickly went to ruins after the last of the monks fled when the property was turned over to the state. We had an early morning flight out of Barcelona airport and decided to spend the last couple of days of our Catalan adventure somewhere closer to the airport. We chose to stay in the Le Meridien Ra in Le Vendrell, set right on the Mediterranean ocean. Unfortunately, the weather was mostly rainy and cloudy by the time we checked in, but we were still able to enjoy the property through use of their excellent spa facilities. We tried ordering drinks at the hotel bar, but service was not their strong point so we decided to leave the hotel to venture down the promenade towards Calafell in search of food and drinks. It wasn’t heavy tourist season, but many of the restaurants in Calafell still had some “callers” trying to lure you into their restaurants with seafood-centric menus in hand. We were still in a Gin Tonica groove, so we looked for a full bar that offered some tapas to go with them. On our first evening out, we chose some random restaurant bar and ordered “Pescadito Frito,” listed as an appetizer to go with our drinks (left photo below). What arrived was a platter so full of perfectly fried little fish that we tried hard to finish but couldn’t. Needless to say, we were never able to move on to a larger course. In San Francisco, or anywhere else we happen on them, we always order “fries with eyes” whenever we have the opportunity, and we are lucky if we get a dozen of them in an order. We couldn’t believe our own eyes when the platter arrived and toasted to our good fortune. 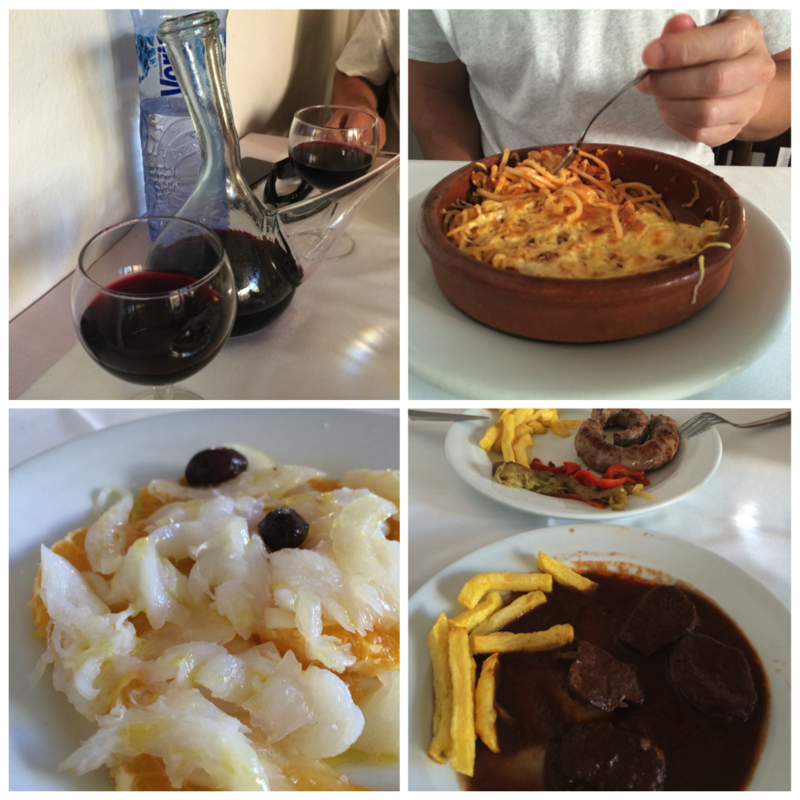 We enjoyed it so much that we ordered another version at Mar Blau the following evening (right photo) as our last meal in Spain, but their version also included some other goodies such as shrimp and peppers. Our good luck with finding great-value set menus continued in Calafell when we walked into Mar Blau for lunch. We didn’t have any reservation (which is highly recommended since they get full, especially on Sundays), but they were able to accommodate us after a small wait. Once again, the 12.50 Euro (~$15 US) three-course menu started with a choice of bottled juice and we selected peach (top left). 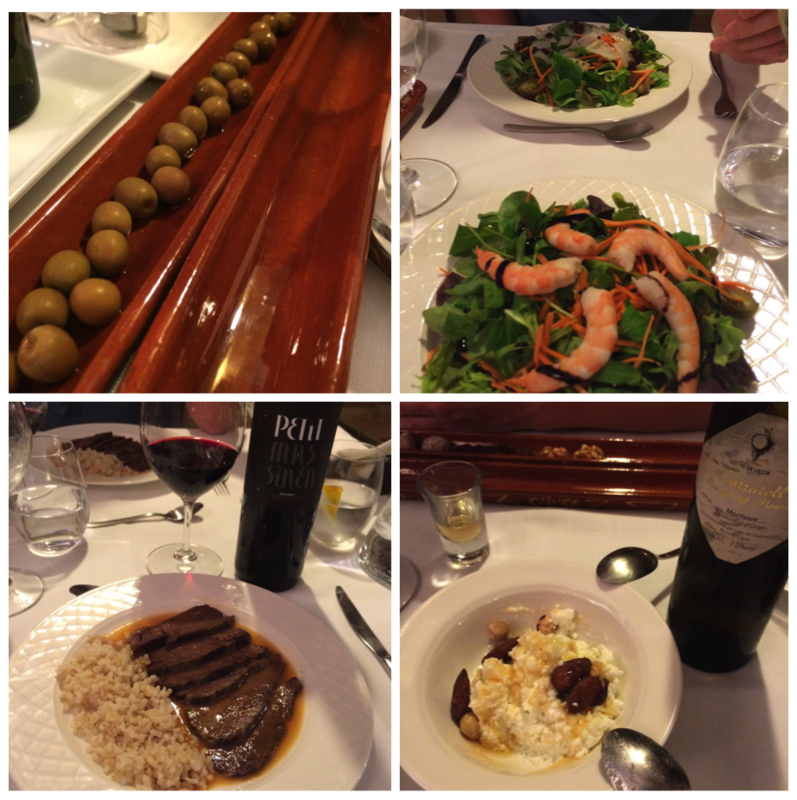 A full bottle of red wine and water was delivered to the table shortly after (bottom left). 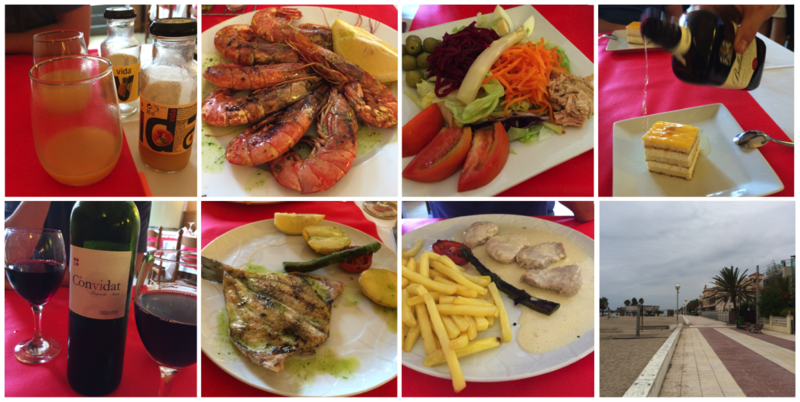 They offer several choices of starters and mains, and one of us selected Gambas ala Plancha (prawns) as the starter and the Dorade fish as her entrée (2nd column). He went with a mixed salad which included tuna and white asparagus to begin with and tournedos of veal as a main (3rd column). All of the items were really excellent, but the grilled prawns were a standout in both flavor and portion size. For dessert, we both had to go with the Whiskey Cake, which turned out to be a perfect sized small cake that was table-drizzled with Ballantine’s Scotch (top right). We walked back to our hotel feeling very sated and wondering where all of the people were (bottom right). We throughly enjoyed this trip to Spain and noted that the biggest change we would make is to spend more time in Priorat. We honestly can’t figure out why Priorat is not so crowded with tourists like other wine regions of the world are. Between the hiking, wine, accommodations, food and overall value, we are hard pressed to think of a more ideal vacation spot for us. 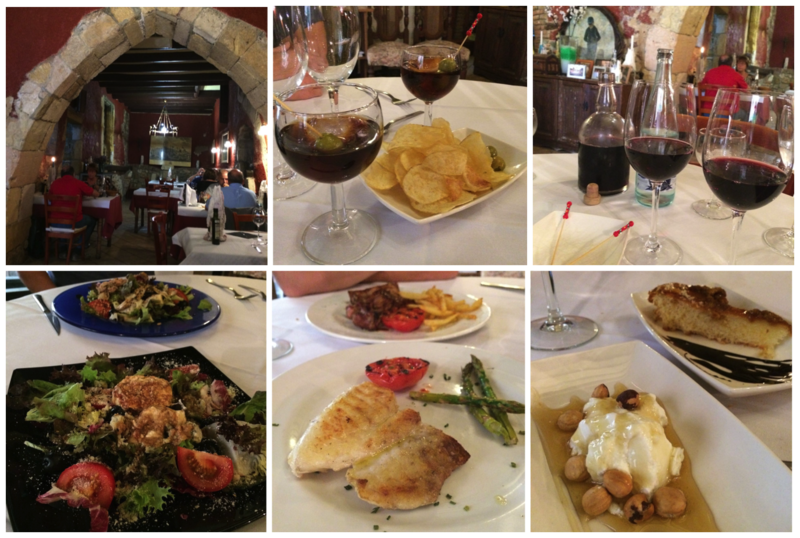 The set menus we encountered outside of Barcelona were an amazing discovery in itself. One thing that is important to note is that English is not commonly spoken outside of Barcelona, so it helps to come prepared with some basic Spanish language skills or a really good dictionary. We got by with our limited Spanish speaking abilities but hope to improve on that when we return. I’ve never heard of Priorat region! Good to know that is something remarkable, and green! I’ve always thought that Spain is all dry. Ilaria, you should plan a visit there. It’s also very close to the ocean so you can have a great beach and hiking vacation!